Our practice is one of only a select few in the state of Illinois authorized to provide Disability and Compensation Evaluations for U.S. Armed Forces veterans claiming hearing loss and/or tinnitus as a service-connected disability. Dr. Steinberg has evaluated hundreds of veterans claiming these benefits. It is his small way to honor the brave men and women who have served our country. If you are a United Stated Armed Service veteran who feels that your hearing loss and/or tinnitus may have been caused or exacerbated while serving, contact our office for more information. Veterans that have hearing loss or tinnitus regardless of service connection may be entitled to benefits through the Department of Veteran’s Affairs (VA). For veterans with hearing loss and/or tinnitus that is not service related, the entitlement of services through the VA may be dependent on income or other factors. We encourage you to contact your nearest VA facility to see if you are entitled to benefits. 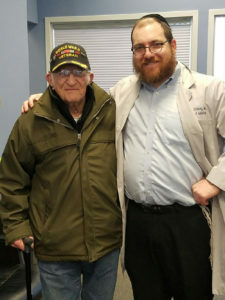 If you are a veteran with hearing loss and are not eligible for treatment through the VA, we honor our veterans with a 20% discount on all treatment including hearing aids.